The Odell Beckham touchdown catch on Sunday against the Dallas Cowboys that made. People. Write. Like. This. Because. It’s. The. Best. Catch. Ever. on social media. However, that play by Beckham wasn’t the only one from Week 12 that was worth watching. We don’t normally put these kinds of lists together, but the week was worth an exception. The Cleveland Browns are not going to regret parting ways with Ben Tate. That’s largely because of rookie Isaiah Crowell, who continues to impress with plays like this. Sure, the Browns were up against the Atlanta Falcons, who couldn’t defend to save their lives, but give Crowell props for making the Falcons look even worse. The Seattle Seahawks pride themselves on being a tough defensive team, but after the Kansas City Chiefs humiliated them in Week 11, the defending champions needed a strong statement game. They got that in Week 12 when they thrashed NFC West leaders, Arizona Cardinals. Tight end Cooper Helfet personified the Seahawks’ relentless defense with this Tasmanian Devil-esque tackle of Rob Housler, who must now be having second thoughts of playing football again. LeSean McCoy has the ability to make people stupid with his out-of-this-world footwork. His latest victim was Tennessee Titans safety Michael Griffin, who dared to break the Eagles running back’s sprint only to get his ankle broken and his ego bruised. We all know where this list needs to end, but Robert Woods did his best to join in on the fun on Monday night against the Jets, snagging a ridiculous one-hander with help from his helmet – a catch that any other week would have been the play of the weekend. Not this week, though. You’ve seen this video already but it’s worth watching again. Beckham’s touchdown grab broke the internet in a manner not even Kim Kardashians bare rump could. We’re going to wait for a long time before the beauty and the sheer athleticism of that catch will be surpassed. But then again, Beckham and the Giants have a game on Sunday against the Jacksonville Jaguars. As of today, NFL betting odds at topbet.eu list the Giants at -2.5 against the Jaguars, and we’re inclined to think Odell should be enough to move that line several more point.. 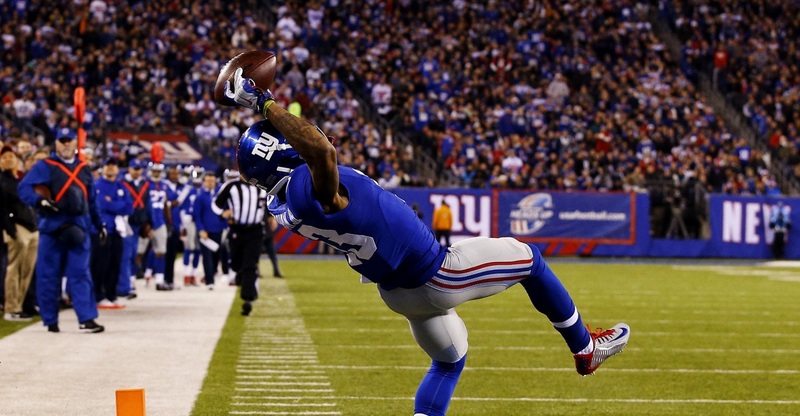 Categories: News and Notes, Odell Beckham Jr.